Sunday afternoon, Tall Husband and I dropped by The 1940 Air Terminal Museum, an Art Deco beauty built the same year we were. It's always an inspiration to see something our age that is still standing. We had missed the Museum's Saturday Wings & Wheels gathering, due to bad weather. Wings & Wheels features a variety of aircraft and classic cars. This was to have been our first time to attend. A tiny Taylorcraft, shown here, had been left in the museum's hangar overnight, as the pilot could not fly out due the storm. We met him and his son, Cody...the coolest kid I've met in a long while...as we visited the museum. Cody and his dad invited us to see their wonderful plane, which Dad had restored himself. Cody was especially proud of the antique brass fire extinguisher which is a working vintage piece. 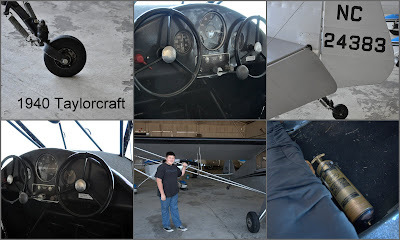 The Taylorcraft, also about our age...vintage, verging on antique...is amazing. The engine has the sweetest sound and the wooden propeller had to be wound, as did the propellers on the toy planes Tall Husband and I built when we were kids. The little 1940 airplane is being pushed out of the hangar. Cool Kid Cody showed off the plane. That little rear wheel is the size of my hand. Also note the vintage brass fire extinguisher. Dad, the pilot, giving the wooden propeller a spin. Here's the "Ground Crew" including Tall Husband. After a call to the tower on my cell phone, the little plane begins her taxi toward the runway. And about here, I was kicking myself for not bringing my lens bag with my telephoto lenses. She's still flying after all these years, just as Tall Husband and I are! 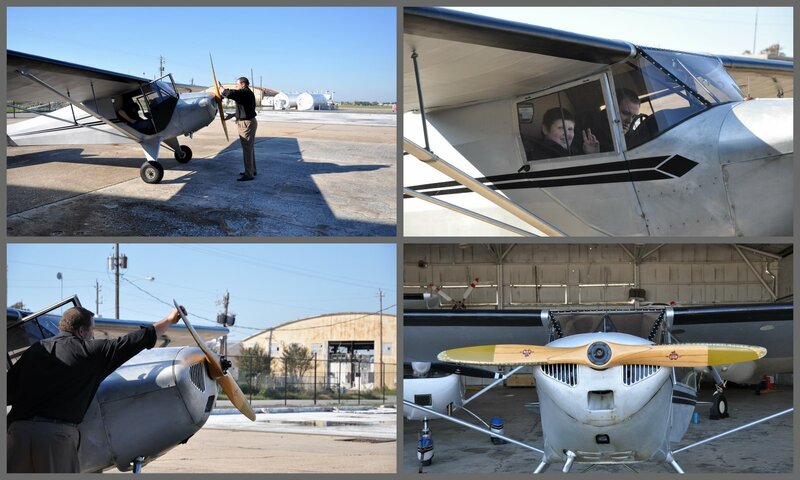 Note: Thanks to members of Houston Spotters, Blair, Max and Emily, pictured with Tall Husband in the fifth photo from the top, for escorting us around and answering all our questions. Oh, how wonderful. It's so nice the plane, and fire extinguisher, were restored. I love it when something is valued AND used.